As we continue re-branding our organization, we have launched customized service packages for small business clientele. We understand small business owners and entrepreneurs need comprehensive accounting services yet often lack the budget and resources. Thus, we have created multi-tiered bundle packages to provide objective analysis and recommendations. Starting from their financials, we use insight into their lifestyle to assists with decision making not solely based on profitability. Better service typically results in better profits over working longer hours. We redirect our client’s focus to help them attain desired success while achieving better work/life balance. More details on packages will be available online shortly. 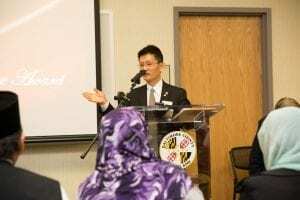 With nearly 30 years serving the Baltimore Metropolitan community, AK and its original namesake, Albert T Kim, were recognized as 2017 recipients of the Baltimore County Asian American Excellence Award, at an event held in May, which is designated as Asian Pacific American Heritage Month. The award is presented to individuals whose life work has successfully contributed to the socioeconomic vitality of the greater Baltimore County region, and whose efforts inspire others to strive for success. Migrating from South Korea in 1975, Mr. Kim has spent his life serving Baltimore. He was a member of the Woodlawn-Westview Rotary club for 20 years, serving as its President in 1999 and 2014. This club served the community by donating dictionaries to area elementary schools and hosting the annual “Service Above Self Awards.” As well, Mr. Kim was the President of the Korean American Society of Greater Washington, Vice President of the Sejong Scholarship Foundation of Maryland, Treasurer of the Security Woodlawn Business Association, and a Board Member of the Korean Society of Maryland. Once a boutique business based around our fearless leader, Albert Kim, AK & Associates has expanded into a progressive group of accounting professionals. Our team approach to partner with clients as their external CFO is redefining roles to better support new and existing clients. We are revitalizing our office with administrative restructuring and recruiting talent to position AK for continued growth and success. These fresh faces and new personnel bring energy and ideas as we redesign our website, expand our services, and branch into social media. Please join us . and new personnel.